Spring Garden Salad - 334/365, originally uploaded by lesleyraez. I love spring! With spring comes fresh veggies from the garden! 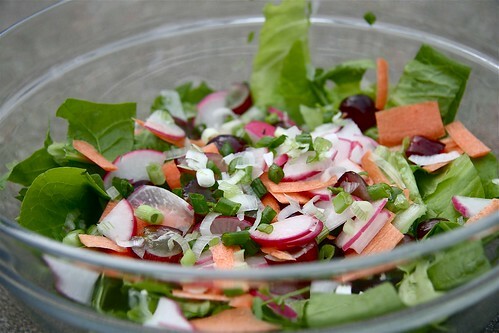 Here's a simple salad recipe that's sure to please. Top it off with the dressing of your choice, I'm quite fond of White Balsamic dressing. Oh that looks good! I think we have major drainage issues in our garden...next year I think we are going to have to build it up and bring in a truckload of dirt. All my lettuce and spinach is yellow after all that rain. Bummer.